Bob Corritore to accompany country legend Jessi Colter for Shooter Jennings opening today! Tim McClellan is a world known trainer and author, as well as a former strength coach for Arizona State University. Jessi has been training with him for the last five years. 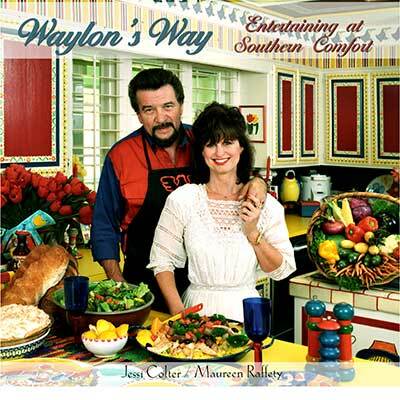 This book is a very personal food chronicle that begins with the early days of traveling on the road, and shows a history of how the food was served and presented at Southern Comfort, the Brentwood Tennessee home of Waylon and Jessi. It is an intimate view into the lives and celebrations of family and friends. Experience the christening of Shooter, the sobriety party for Johnny Cash, as well as wonderful family dinners. The book revolves around the family happenings, and the wide variety of foods, for all occasions, and reflects the changes that were often implemented for a healthier life style. Not just a collection recipes, it also has wonderful stories, beautiful pictures, and memories of our life together. Most of the recipes were served many times on the sideboard, with family and guests going back for seconds, most of the time. Waylon was very proud of the food that was served at Southern Comfort, and he much preferred to eat and entertain at home. He often encouraged us to make this project happen, because he believed the best food he could get was at home. The project started many years ago, and was put on the shelf because of illness and the untimely passing of Waylon. We are proud to present it now. Please pull up a chair and join us, and we hope you will feel as if you are a guest at Waylon's table. In it's initial publication, this book is exclusively available to fans via www.officialjessicolter.com. Print Edition Details: 192 pages, 8.5" x 8.5", perfect binding, white interior paper (80# weight), full-color interior ink, white exterior paper (100# weight), full-color exterior ink. A sample of the cookbook may be downloaded here as a 12 page .pdf file. Enjoy. "Waylon was born in West Texas, I was born in Arizona, and Maureen Raffety, our "chief of staff," hails from Kentucky. Between the three of us, we have come up with meals that incorporate the taste of the West and the flair of the South. Our menus were created by Maureen, while Waylon and I helped guide the delicate balance of unforgettable flavors. This is how the three of us spent much of our time. Waylon had a voracious appetite and enjoyed a bountiful table three times a day. This inspired Maureen, whose culinary skills have thrilled guests that have joined us from all over the world. We invite you into Southern Comfort, our Nashville, Tennessee home, where we have loved and laughed our way through life's ups and downs. We want to share these times with you. Our hope is that you will enjoy the humor along with the recipes that we have developed while working our way from rich, creamy butter to light, virgin olive oil. " 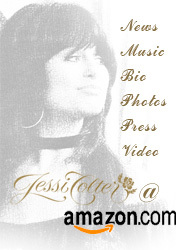 Introducing the newest addition to the Official Jessi Colter Website... Jessi's Trading Post. 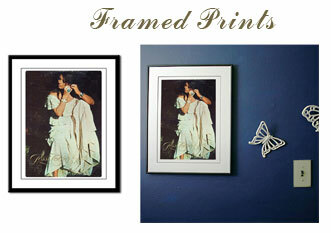 We'll be featuring a great selection of 'Exclusive' Jessi Colter merchandise. You won't be able to find any of these items anywhere else but here. We're starting out with some great collectable framed prints of Jessi, along with some carefully chosen clothing items. 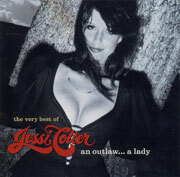 We hope you enjoy this new addition to the Official Jessi Colter website....! Visit the Trading Post..
Jessi Colter joins Deana Carter on her newest release "The Chain" for an incredible new version of "I’M NOT LISA." Deana says: "Supposedly, the original version of this awesome song was recorded at my Dad’s studio, Nugget Records. From there, it apparently went to L.A. and then around the world. Jessi Colter is such an amazing writer and gives an incredible performance on this version, as well as the original. Rumor has it that a demo of this song found its way to a Waylon session that Dad and all the guys were on, and they were blown away, except…the tape had no name on it, so they were looking for this awesome creative young woman with the killer voice, killer song, who recorded this ‘tape with no name’! When they found out how gorgeous she was, well…..they were tripping all over themselves. Then, she and Waylon made history!" Out of the Ashes is Jessi Colter's triumphant return to recording. After being encouraged by friend Ben Harper to return to music, she has delivered a deeply personal stellar collection of originals and hand-picked covers that mixes country, blues, gospel, and rock. Producer Don Was (Rolling Stones, Bob Dylan), assembled a strong backing band—with Don himself on bass, Colter stalwart Reggie Young on guitar, and a guest appearance by Shooter—to lay Jessi’s vision down on tape. As a special bonus, he and Jessi completed an unreleased song from the late ’80s that features vocals by Tony Joe White and Waylon Jennings. DVD + CD Release of "Never Say Die: The Final Concert Film"
Waylon's saga continues with a new round of video and audio collections, beginning with Never Say Die: The Final Concert Film. This three-disc set chronicles the historic concerts at Nashville's Ryman Auditorium in January 2000 -- an event that brought his reunited legendary Waymore Blues Band back to Music City for one last all-star farewell tribute show in Waylon's honor, with special guest appearances by his wife Jessi Colter (on four songs), John Anderson, Montgomery Gentry, and Travis Tritt. The Never Say Die package premieres the full-length concert DVD (approximately two hours), 22 performances in stereo and 5.1 mixes; plus an exclusive 30-minute featurette with never-before-seen rehearsal footage and interviews conducted in 2000 with Waylon, Jessi, Bobby Bare, Kris Kristofferson, Willie Nelson, Chet Atkins, Richie Albright and others. In addition, the full-length concert is presented on two CDs with eight previously unreleased tracks. This three-disc edition will arrive in stores July 24th on Columbia/Legacy, a division of SONY BMG MUSIC ENTERTAINMENT. "Colter's new CD features one song with her son -- Shooter Jennings -- and another with Tony Joe White and Waylon Jennings himself. She tells Don Gonyea what made her want to return to a solo recording career." "Never Say Die: The Final Concert Film"